Slow down. If more drivers followed this tip in the rain, accidents would dramatically decrease. Wet weather doesn’t receive the same attention as winter weather driving, but it should. 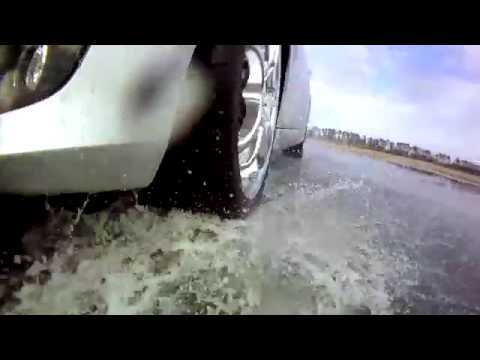 Wet roads present similar dangers-less grip and longer stopping distance, for example. Check the air pressure and tread depths of your tires monthly. If you have a front wheel drive: turn into the direction in which you are skidding. Remove steering correction as the rear axle begins to regain traction and straighten back up. If you have a rear wheel drive: ease up on the gas pedal and turn away from the skid. Remove steering correction as the rear axle begins to regain traction. If you have an all wheel drive: turn in the same direction that you are skidding and maintain light acceleration. Remove steering correction once the rear axle starts to regain traction. Check your tire pressure monthly. Underinflated tires increase fuel consumption. Overinflated tires have less grip. Underinflated tires are one of the biggest causes of using excess fuel in the world. The American Automobile Agency has stated that operating a vehicle with underinflated tires can result in a 25% reduction in fuel economy. The lower the rolling resistance, the less effort from your engine, the better the gas mileage. Turn off the engine when the car is at a standstill, for example in a traffic jam or at a railroad crossing, if it is safe to do so. Want to learn more about sustainability and MICHELIN? Choose tires that have “fuel economy” as one of their main performance characteristics. Tires that have “traction” as their main characteristic will often have reduced fuel economy; winter tires and tires for heavier vehicles such as SUV and light trucks might not be the most fuel-efficient. Always observe highway speed limits. Activate your turning signal well in advance before changing lanes. Avoid sudden or erratic steering or you may lose control of your car and roll over. Tilt your rear view mirror slightly to reduce the dazzling effect of the car headlights behind you. If your rear view mirror has the option, switch to night setting. Don't look directly at the headlights from cars traveling in the opposite direction. Turn on your low beam headlights and fog lights. Reduce your speed and refrain from passing other vehicles. Keep an eye out for obstacles or debris being blown on to the road. Be very careful passing taller vehicles especially in exposed areas or on bridges. Carry the tools necessary in case you break down (for a full list see Precautions and Emergencies). Check the condition of your spare tire: the appropriate pressure is especially important. Tell at least one other person where and when you are traveling and when you are due back so they can alert emergency services If you don't return on time. Blow your horn in advance if your view is blocked during cornering. Never speed or pass in sharp turns where you may not see oncoming vehicles. 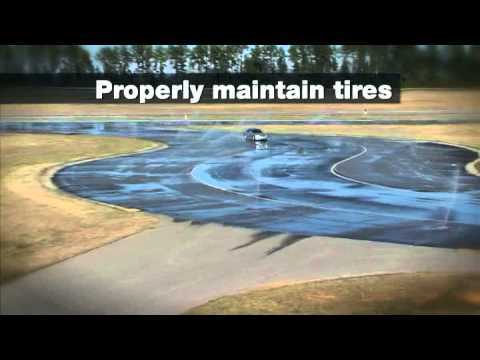 Observe tire tracks of other vehicles to gauge the depth and consistency of the mud. Determine the type of vehicles that have left the track from the sizes and widths of the track. Use that information as a reference to decide if you can get across. Try to avoid changing lanes in slush. It’s safer to change lanes when slush is not on the road. Want to learn more on winter conditions? Lowers concentration levels and extends reaction time. Take a minimum 15-minute break after driving for two hours and stretch. Don’t stare at the centerline of the road all the time. Keep the vehicle well ventilated and at a comfortable temperature. Your focus on the road can be severely reduced by pain or strong emotional situations. If you are taking medication and are unsure about its effects, consult your doctor or pharmacist before driving. Do not consume any alcohol before you drive and be aware of the legal limits. Designate a driver or hire a taxi if you have consumed alcohol. Remain calm and do not panic; it will help you make rational, calm decisions. Try to brake in a straight line if possible. If you are driving at a high speed when the emergency occurs, try to avoid sudden steering since it may result in accidents that can otherwise be avoided. You can steer far more effectively at slower speeds. Slow down as much as possible to reduce the impact of a potential collision. Your main priority is to save lives. If an accident is unavoidable, take priority actions that ensure the safety of human life first. Turn on your hazard lights as soon as possible. Make sure you have emergency numbers and insurance numbers on hand at all times. Release the gas pedal gently. Steer the car in the direction where the back of the car is sliding. Shift to a lower gear quickly and use the engine to slow down. Turn on hazard lights as quickly as you can until you regain control. Apply hand brake if necessary. Hold the steering wheel firmly. If this happens before entering a turn, try to control the direction first. Then try to slow down: shift down gears step by step to slow down. Use the handbrake /emergency brake to stop the car if the speed is below 20 mph. Turn on your hazard lights if applicable. Use upward slopes or hills to help stop the car. If your brakes stop working when going up a hill, shift quickly to lower gear, then use the handbrake/emergency brake to park the car. If available, park in an emergency parking lane, or hard shoulder. If not, then park away from fast traffic and ensure your hazard lights are turned on. Test brakes before your trip. Always test your brakes when you first start down a steep hill or if you have driven through deep water. Note on the video: The footage is shot at a professional course with a professional driver and tire-explosive testing equipment. The loud noise will surprise you but try to stay calm. Don’t slam the brakes, keep your foot on the gas and accelerate to maintain the momentum of the vehicle. Keep the direction of the car as straight as possible. Brake slowly to maintain control of the vehicle and lower the speed. Bring the car to a stop in a safe place.